Entering its fourth academic year, Habib University is ever-grateful for its growing network of supporters. The first classroom inauguration of 2018 is the Kassim Parekh Classroom. The classroom was inaugurated in honour of late Mr. Kassim Parekh, a highly successful banker, a hardworking individual, and a friend to many. 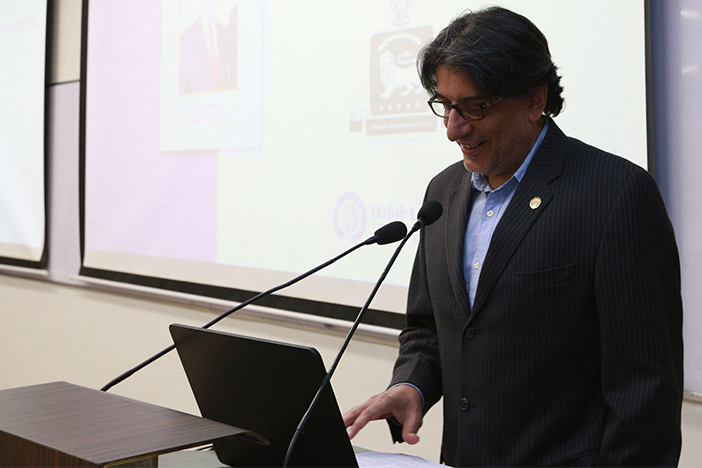 The heart-warming ceremony was opened by Mr. Wasif Rizvi, President of Habib University, reflecting on a classroom being “more than just a physical space, (but) a space that motivates, educates, and inspires the next generation”. He went on to say that “we cannot think of honouring a more towering figure, than that of Kassim bhai, nor can we think of a better platform than a university: an institution that transcends time and history.” The name of HU received a major boost by putting a name as formidable as Kassim Parekh’s to one of its most centrally located spaces. The classroom is situated “geographically right in the heart of the university”. HU President Wasif Rizvi opening the inauguration ceremony. Craig Phelan, Dean of the School of Arts, Humanities, and Social Sciences, explained the importance of a classroom at Habib University, as “an evolved transdisciplinary learning space”. At HU, classrooms contain moveable tables and chairs with which “alternate arrangements can be made in a safe environment where opinions can be shared freely and actively to promote student opinions, and they provide the latest technology to stimulate learning”. Classrooms are thus “spaces where wisdom is not imparted or dictated but facilitated, with a changing role of the professor within them.” Not only students are the only ones learning, but professors too, who learn from their students. The classroom being dedicated today promotes interdisciplinarity, with courses spanning from history and philosophy to languages and physics, encompassing all the disciplines we teach at HU. 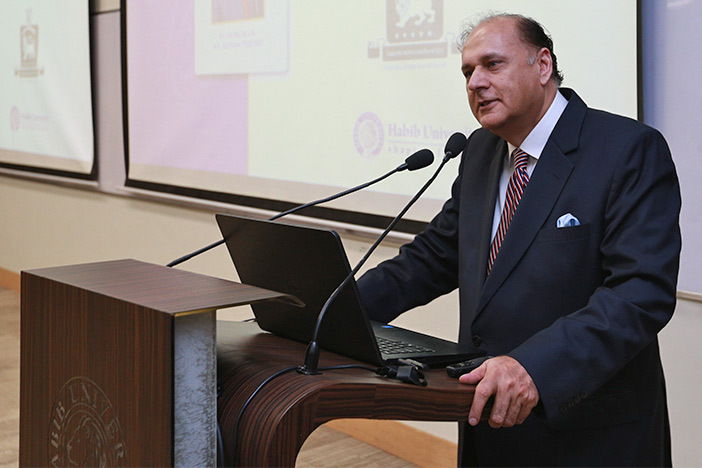 Mr. Sirajuddin Aziz, CEO of Habib Metropolitan Bank talks about importance of planning in education to societal growth. Mr. Kassim Parekh’s son, Mr. Zubair Parekh, elaborated on his father’s personal life that can also serve as role model to others: “while my father was a respected banking figure, he was also known as a hardworking and dedicated individual. Much of his success had very much to do with working on time and being on time.” Late Mr. Parekh was also an avid philanthropist, making sure that “people are fed breakfast in the morning, so that they will have more chance to improve their livelihoods in the course of the day”. Mohamedali Rafiq Habib, Chairman of HMB and Group CEO Habib Bank Zurich, also remembered Mr. Parekh with words of kindness and passion. Further, he introduced a painting commissioned in Mr. Parekh’s honour, which will remind people of “the legacy he left behind at HMB and now at HU. It is a legacy we are committed to continue as the classroom will carry his name in hope of inspiring a generation of students to study and be inspired by who he was”. 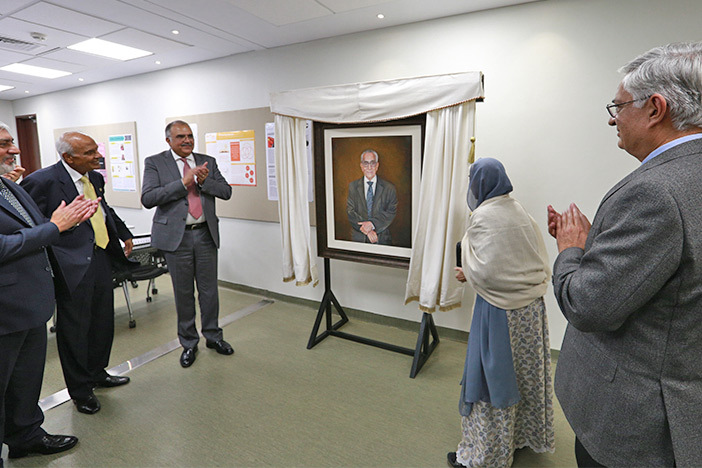 The family and friends of late Mr. Kassim Parekh unveiled his beautiful portrait in the Kassim Parekh Classroom. 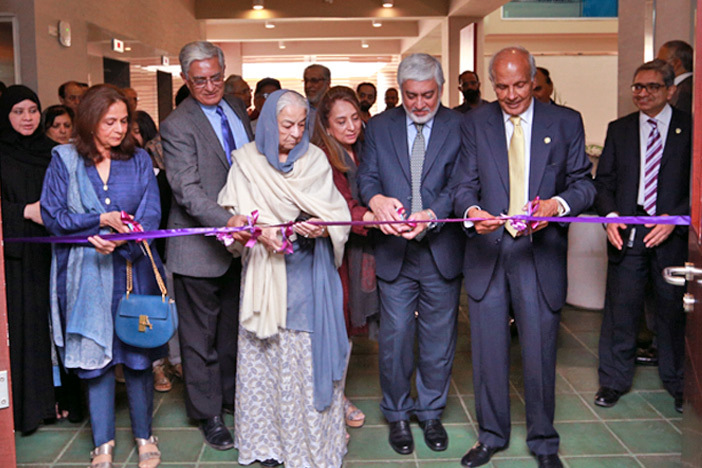 After cutting the ribbon and viewing the Kassim Parekh Classroom, which was decorated by HU student work of diverse subject areas, the guests proceeded to enjoy lunch in one of the campus’ open-air courtyard during the pleasant winter weather. Conversation continued on the importance of higher education reaching wider and further to bring Pakistan’s diverse communities together in a shared cause.